Thresholds: Contemporary Thai Art offers a reflective and, at times, bracing view onto the contemporary art scene of one of Southeast Asia’s most dynamic cultures. Featured only months ago at Sundaram Tagore New York, Thresholds is curated by art historian Gregory Galligan, director and co-founder of the Thai Art Archives in Bangkok, who demonstrates by way of six case studies how contemporary Thai artists are addressing timely social, political and artistic issues in their work. Thailand is frequently in the news for, paradoxically, its exceedingly accommodating tourist industry and its turbulent political factionalism, both of which often occlude outsiders’ view of the nation’s sophisticated contemporary artistic culture. Over the last decade, contemporary Thai artists have regularly participated in virtually all of the world’s major biennials, triennials and art fairs, yet few global observers have had the opportunity to directly engage with contemporary Thai artistic developments in any concentrated context—perhaps with the exception of the nation’s leading multi-platform artist Montien Boonma (1953–2000), multi-platform star of relational aesthetics Rirkrit Tiravanija and “slow” cinematographer Apichatpong Weerasethakul (Uncle Boonmee Who Can Recall His Past Lives, 2010). Thresholds aims to address this gap by presenting recent key work by six established Thai artists: ANGKRIT AJCHARIYASOPHON—an accomplished mid-career practitioner of Thai non-objective abstraction; NIM KRUASAENG—an emerging, self-taught painter of sublime forms based on everyday objects and quotidian silhouettes of nature; SAKARIN KRUE-ON—one of Thailand’s most globally accomplished artists working in multi-platform formats, not long ago celebrated at Documenta XII (2007) for his critically acclaimed Terraced Rice Fields Project; KAMIN LERTCHAIPRASERT, co-founder with Rirkrit Tiravanija of the artists’ collective The Land (f. 1998), and a practitioner of Buddhist-inflected drawing, painting, sculpture and participatory site-specific projects; NIPAN ORANNIWESNA—a widely celebrated, if primarily Asia-based, multi-platform conceptualist, whose work engages issues of political strife, cultural censorship and social “mapping”; and PHAPTAWAN SUWANNAKUDT—Thailand’s premier female master of traditional Thai mural painting turned to contemporary dialogues. 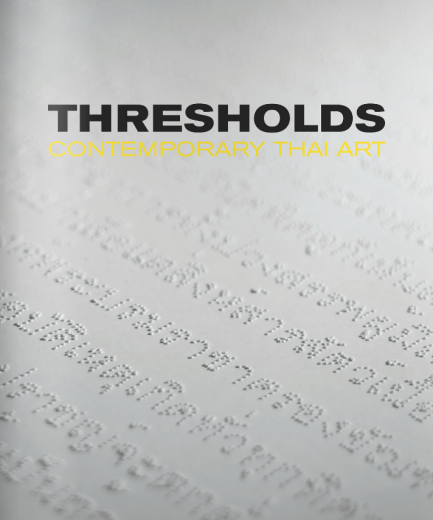 Thresholds offers a multi-faceted look at contemporary Thai art, throwing into relief its aesthetic and conceptual complexities, its ever-topical underpinnings and its vital presence in the global contemporary art scene since the early 1990s. At the same time, this show suggests that contemporary Thai artists are now approaching a newly turbulent juncture in their nation’s long and frequently conflicted evolution. Gregory Galligan, PhD, is the director and co-founder of the Thai Art Archives in Bangkok. He is a widely published independent curator and art historian, formerly based in New York (1985–2009), where he wrote for numerous publications, among them ArtAsiaPacific, Art in America, The Art Bulletin and Arts Magazine. He has recently co-curated (with Gridthiya Gaweewong and the collaboration of Hans Ulrich Obrist) [Montien Boonma]: Unbuilt/Rare Works, and is currently writing a book on the alternative art movements of Thailand since the mid-1980s.